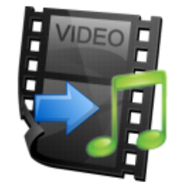 - Extract music from your favorite videos and save them as music on your phone! - Extract music from movies and save them as ringtone. Usefull when you want to set the greatest quotes of your favorite movies as ringtone.